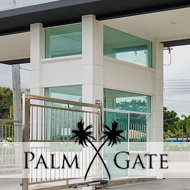 At the later stages of this building project in Pattaya, Thai Garden Design were contacted to come in and evaluate options for the owner, who wanted to create a modern landscape to befit the modern building he had constructed, helping him to promote and sell units. Earth levels of the plot were quite low, and generally the plot was bare. In order to create an attractive, welcoming garden, the team began by building retaining walls that would hold earth, raising the levels running alongside the building, therefore making it easier to 'step up or down' and traverse around the plot. The overall job consisted of many different landscaping elements to finish the garden – grassing, tiling, gravel beds, planting, pathway stones, as well as building an outdoor pool shower. Drainage was an issue with the plot, with large amounts of roof run off during the wet periods. The landscaping throughout was installed with earth levels in mind, in order to enhance and promote good drainage. Parts of the garden were finished in grey gravel, and custom built pavers, in grey stone wash, which results in a very modern and easy to walk garden. The finished landscape ensures that the project now looks ready for sale. The new materials and improved access mean showing prospective buyers around the units is seamless, offering many talking points, and chances to admire the tropical planting and ambiance these create. For more information on this condo project, please visit metro-beach.com. If you are looking to drastically improve your home garden, work or office landscape, or development in Thailand, contact [email protected] for more information on how we can assist. Landscape gardening is a really creative process. You can add so many features in your garden landscape. There are so many ideas that you can implement to enhance the look and effect of your garden.